They work around the clock, searching for firewood at dawn, lighting the morning fire, fetching water, growing and preparing food, caring for children and other family members — along with the endless other tasks and chores that keep a household running. Yet although these functioning households lie at the heart of Bolivian society, the contribution of rural women to the economy remains largely unacknowledged. But this has started to change. An alliance of 12 social women’s organizations has spearheaded a project to amplify Bolivian women’s voices during the lawmaking process, following the 2009 drafting of a new national constitution. Supported by UN Women’s Fund for Gender Equality since November 2010, the initiative aims to mainstream women’s demands in the country’s future legal framework and processes. It has placed particular focus on ensuring parity in parliament, drafting a law on political harassment, and legally recognizing unpaid work. 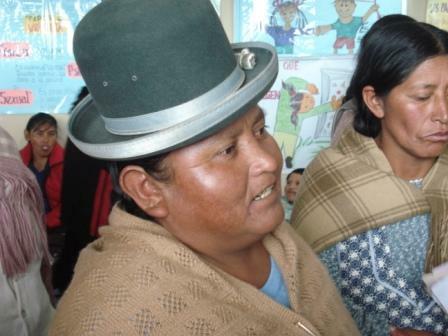 Addressing the opportunities of rural women is critical in Bolivia, where 90 percent of the rural population is poor, and welfare indicators identify women as especially vulnerable. For example, 31 percent of girls between 10 and 18 years old do not attend school, and one in three female Bolivians is illiterate. As highlighted in the UN inter-agency report on “Rural Women and the Millennium Development Goals”, this will severely impact not only their futures, but also those of their families and communities, ranging from the kind of salary that they will command in the future and their vulnerability to violence, to the health and nutritional levels of their children. UN Women’s Fund for Gender Equality works to advance the empowerment of women and girls at the global level through multi-year, high-impact grants of up to a million dollars, given directly to women’s organizations and governmental organizations that are committed to gender equality throughout the world. STUDENTS FOR DEVELOPMENT, MAKING A DIFFERENCE.